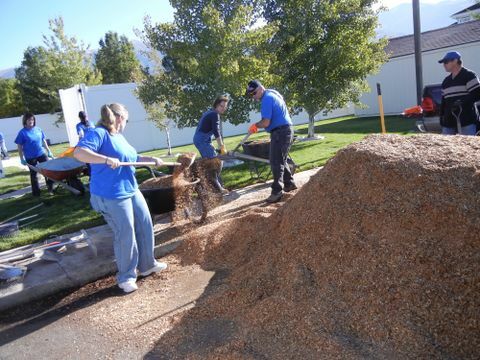 SALT LAKE CITY, Nov. 15, 2011 -- Northrop Grumman Corporation (NYSE:NOC) recently provided an $800 grant for employee volunteers to support the Safe Harbor Crisis Center in Kaysville, Utah. The Safe Harbor Crisis Center provides a secure home for victims of domestic violence. 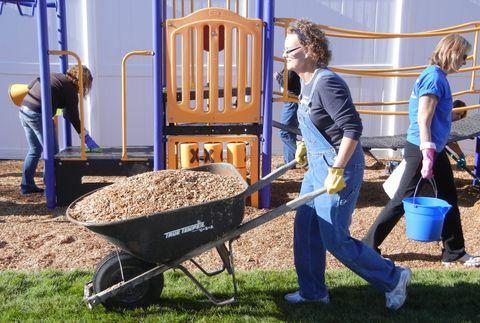 Seventeen employees from the company's Navigation Systems Division in Salt Lake City helped improve the center's playground and bedrooms, ensuring that the facility meets safety code requirements and can continue to serve families in need. On Oct. 14, volunteers cleaned the playground equipment and filled in the play area's surfacing with additional wood chips to ensure that it meets the 12-inch depth required by Davis County. Additionally, volunteers replaced dilapidated shelving in the center's bedrooms. "We are proud to support local organizations that fill an important need in the communities where we work and live," said Liz Iversen, sector vice president and general manager of Northrop Grumman's Navigation Systems Division. "We applaud the employees who generously donated their time to help make the shelter even safer and more comfortable for our neighbors."